Hugh Patterson was a cop. He was a good cop. Until he was a dead cop. 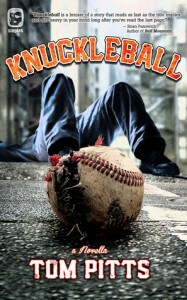 While I have no idea what a knuckleball is, and have even less interest to check it out, Pitts uses the ongoing motif of a series of baseball games between the Giants and the Dodgers (no idea about them either) to pull off a intertwining setting of the games and the murder of a cop. Patterson is a mild mannered cop who hasn´t an inch of cyncism in his bones who walks the beat with his partner, Alvarez, on Mission street in San Francisco. One of the old fashioned cops who believes if only he knows everyone´s name and greet them with a smile they will form some sort of relationship with him, and the police in more general terms. Thugs and drug dealers as those are who move around in the neighborhood. And then there is Oscar. A 15 year old who lives with his older brother, Ramon, and their mother. A huge Giants fan who hates Ramon as he is tormented by him ruthlessly. While the cops are looking for the killer, with a description which fits everyone and no one, the dead cop Patterson is made into some kind of larger than life figure and hero by the media and indeed Giants fans alike in the city. One of those deads who will live forever in memories, who normally would be forgotten in a heartbeat. The bloodlust, the cry for vengeance is getting strong with the crowd, and the killer has to be found, blood money and all. Which I found very fitting how it is described without going overboard just once. It simply feels as realistic, even gritty, as possible when compared to media coverage about similar incidents. Pitts ties everything together very smoothly. The dead cop, his partner, Oscar and his relationship to Ramon and the ongoing search for the cop killer. The smartest move is probably the omniscient POV. Reading through the novella, taking in all the different situations and motivations, makes this particular POV with its lean, smart and ultra-realistic prose just exciting. It´s crisp, it´s mean, and very, very smart how the story moves forward while Pitts keeps pushing his genuine characters around. Everybody has something to hide. Small things really, or ugly, dark secrets, until they keep spiraling out of control due the circumstances they find themselves in. There is more than one truth in everyone´s words and actions, while the blood is literally flooding the streets, and you can smell the sour, stale taste of beer. Smell the mild scent of the weed smoked in alleys. Characters screw up, try to hide the fact that they screwed up, and screw up even more. The psychological part, the question of "why?" they do what they do is a huge part of what makes this novella so cool for me. It is inevitable that not every question can, maybe not even should be, answered, but all the pain and the stress of the situations becomes truly alive. Pitts here clearly is more interested in the characters´ motivations than to talk about "who done it", and the ending is ambigious, open to interpretation, even when clued in about right from the start due this particular narrative technique. It´s dark, it´s bloody, and I guess that´s what you call a homerun.